A major focus of the research at the Pulmonary Center focuses on epithelial cell and molecular biology. This focus relates to the central role that the pulmonary epithelium plays in normal lung function, and to the fact that a key element of lung diseases is dysregulation of epithelial cell function and growth. The broad research goals are focused on developing a detailed understanding of how epithelial genes are regulated during lung development and during injury-repair and cancer. Studies are directed at understanding how specific subsets of genes are selectively expressed at different sites along the bronchial tree. The counterpart to understanding normal epithelial gene expression is to characterize altered regulation during disease pathogenesis and tumor progression. All of these diverse studies have a common objective, that is, to develop an understanding of disease processes in sufficient molecular detail to allow the design of highly specific therapeutic interventions in human patients. Research in epithelial biology was initiated at the Pulmonary Center in the 1970s with studies exploring the mechanisms of neutrophil elastase-induced emphysema in experimental animals. Since that time the group has grown to include a large number of senior and junior investigators, fellows, graduate students and technicians. Currently, the Lung Epithelial Biology Program brings together a multidisciplinary team of investigators with research interests in developmental and stem cell biology, lung regeneration, lung cancer, genomics and bioinformatics. 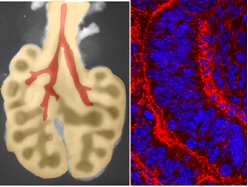 Funding for studies in epithelial biology derives from multiple sources such as NIH/NHLBI individual RO1 grants and a Developmental Biology Program Project grant, a NIH/NIEHS Genes and Environment Initiative, the Doris Duke Charitable Foundation, American Lung Association, Parker B. Francis Fellowship and other sources. Investigators meet in weekly conferences to share expertise, discuss ongoing research, and review relevant publications. In addition, the investigators have a variety of ongoing interactive studies with the Pulmonary Immunology group, with other divisions of the Department of Medicine and with the Department of Pathology. Regulation of lung cell fate in early respiratory progenitors and mechanisms of induction of the lung primordium in the embryo. Role of microRNAs, chromatin modifications and DNA methylation in early lung organogenesis. Mechanisms of lung epithelial lineage specification in stem (ES) cells or induced pluripotent (iPS) stem cells. Regulation of secretory, ciliated and neuroendocrine cell fate in the developing and adult airways. Defining the impact of cigarette smoke on airway epithelial gene and microRNA expression and exploring how variability in this genomic response can serve as a biomarker for lung cancer among smokers. Development of a new tumor staging paradigm for resectable NSCLC that identifies patients who may require adjuvant therapy to prevent recurrence. Role of microRNAs in idiopathic pulmonary fibrosis. Characterization of molecular mechanisms that control flattening of lung alveolar epithelial type I cells during development. Identification of gene and microRNA expression changes that occur with disease progression in lung tissue from smokers with emphysema. To pursue these studies, researchers make extensive use of genetically altered animals and cells engineered to overproduce, ectopically produce, or underproduce a specific protein. These approaches are complemented by in vitro methods that use cell and organ cultures, cell isolation and purification by cell sorting, standard molecular biochemistry, morphologic techniques including immunohistochemistry and in situ hybridization, and others. Gene expression levels are determined by quantitative real-time polymerase chain reaction measurements. All investigators utilize gene expression microarrays to characterize molecular cellular phenotypes in select epithelial cell populations. Spira A, Beane JE, Shah V, Steiling K, Liu G, Schembri F, Gilman S, Dumas YM, Calner P, Sebastiani P, Sridhar S, Beamis J, Lamb C, Anderson T, Gerry N, Keane J, Lenburg ME, Brody JS.Airway epithelial gene expression in the diagnostic evaluation of smokers with suspect lung cancer. Nat Med. 2007 Mar;13(3):361-6. Tsao PN, Vasconcelos M, Izvolsky KI, Qian J, Lu J, Cardoso WV. Notch signaling controls the balance of ciliated and secretory cell fates in developing airways. Development 136: 2297-2307, 2009. Tsao PN, Chen F, Izvolsky KI, Walker J, Kukuruzinska MA, Lu J, Cardoso WV. Gamma-secretase activation of notch signaling regulates the balance of proximal and distal fates in progenitor cells of the developing lung. J. Biol. Chem. 283:29532-29544, 2008. Sommer CA, Stadtfeld M, Murphy GJ, Hochedlinger K, Kotton DN, Mostoslavsky G. “iPS Cell Generation Using a Single Lentiviral Stem Cell Cassette.” Stem Cells. Dec 18, 2008 [Epub ahead of print]. Wilson AA, Kwok LW, Hovav AH, Ohle SJ, Little FF, Fine A, Kotton DN. “Sustained Expression of alpha1-antitrypsin After Transplantation of Manipulated Hematopoietic Stem Cells”. Am J Respir Cell Mol Biol. 39(2):133-41. Aug 2008. Mammoto, A., Connor, K.M., Mammoto, T., Yung, C. W., Huh, D., Aderman, C.H., Mostoslavsky, G., Smith, L.E.H. and Ingber, D.E. A mechanosensitive transcriptional mechanism that controls angiogenesis. 2009. Nature. Doi:10.1038. 457:1103-1108. MH Lowry, BP McAllister, LAS Brown, E C Lucey, S Amar, WW Cruickshank, JC Jean, P Johnson, K Braun, T Wight, and M Joyce-Brady. Lung Lining Fluid Glutathione Attenuates IL13 Induced Asthma. American J Resp Cell Molec Biol. 38 (5): 509-516, 2008. M Joyce-Brady, JC Jean, RE Marc, LAS Brown, Lung Lining Fluid Glutathione in Antioxidant Defense and Cysteine Supply, In RM Mohan (ed), Research Advances in Respiratory, Cell & Molecular Biology 1, pp. 1-18, Kerala: Global Research Network, 2009. Hoffman A, Awad T, Spira A, Palma J, Webster T, Wright G, Buckley J, Davis R, Hubbell E, Jones W, Tibshirani R, Tompkins R, Triche T, Xiao W ,West M, Warrington J. Expression profiling – best practices for data generation and interpretation in clinical trials. Nature Reviews Genetics. 5: 229-38, 2004. Tsao PN, Chen F, Izvolsky KI, Walker J, Kukuruzinska MA, Lu J, Cardoso WV. Gamma-secretase activation of notch signaling regulates the balance of proximal and distal fates in progenitor cells of the developing lung. J. Biol. Chem. Aug 11. [Epub ahead of print], 2008 (in press). Izvolsky KI, Lu J, Martin G, Albrecht K, and Cardoso WV . Systemic inactivation of Hs6st1 in mice is associated with late postnatal mortality without major defects in organogenesis. Genesis 46:8-18, 2008. Chen F., Desai T., Qian J., Niederreither K., Lu J, and Cardoso WV. Inhibition of Tgf beta signaling by endogenous retinoic acid is essential for primary lung bud induction. Development 134: 2969-2979, 2007. Lü J, Qian J, Keppler D, Cardoso WV . Cathespin H is an FGF10 Target Involved in BMP4 Degradation during Mouse Lung Branching Morphogenesis J. Biol Chem 282:22176-22184, 2007. Cardoso, WV and Lu, J. Regulation of early lung development: questions, facts and controversies. Development 133: 1161-1624, 2006. Desai T, Chen F., Lu J, Qian J, Niederreither K., Dollé, P., Chambon, P., and Cardoso WV. 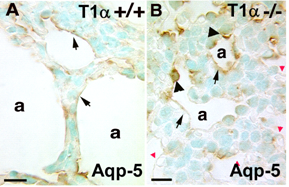 Distinct roles for retinoic acid receptors alpha and beta in early lung morphogenesis. Dev. Biol., 291:12-24, 2006. Lu J, Izvolsky KI, Qian J, and Cardoso WV. Identification of FGF10 targets in the embryonic lung epithelium during bud morphogenesis. J. Biol Chem 280:4934-4841, 2005. Lü J, Qian J, Tang X, Li C, Chen F, Cardoso, WV. Differential expression of components of the microRNA machinery during mouse organogenesis. Biochem. Biophys. Research Com. 334:319-323, 2005. Jean JC, Lü J, Joyce-Brady M, Cardoso WV. Regulation of Fgf10 gene expression in murine mesenchymal cells. J. Cell Biochem., 103:1886-1894, 2008. Millien, G., Beane, J., Lenburg, M., Tsao, P., Lu, J., Spira, A., Ramirez, M.I. (2008) Characterization of the mid-foregut transcriptome identifies genes regulated during lung bud induction. Gene Expression Patterns 8(2):124-139. Pogach M.S., Cao, Y., Millien, G., Ramirez, M.I., Williams, M.C. (2007) Key developmental regulators change during hyperoxia-induced injury and recovery in adult mouse lung. J. Cell. Biochem. 100(6):1415-29. Kathuria, H., Cao, Y.X., Hinds, M.I., Ramirez, M.I. , Williams, M.C. (2007) The ETS protein ERM regulates caveolin-1 transcription in mouse lung epithelial, but not endothelial cell lines. J Cell Biochem. 102(1):13-27. Murphy, J., Summer, R., Wilson , A.A., Kotton, D.N., and Fine, A . The Prolonged Life-Span of Alveolar Macrophages. American. Journal Respiratory. Cell Molecular Biology 38 : 380-385, 2008. Summer, R., Fitzsimmons K., Murphy, J, and Fine, A. Isolation and Characterization of an Adult Lung Mesenchymal Progenitor Cell. Am J Respir Cell Mol Biol. 37:152-9, 2007. Murphy GJ, Mostoslavsky G, Kotton DN, and Mulligan RC. “Exogenous Control of Mammalian Gene Expression via Modification of Translational Termination.” Nature Medicine 12(9):1093-9. Sept 2006. Kotton DN, Fabian AJ, Mulligan RC. 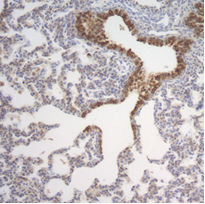 “Failure of Bone Marrow to Reconstitute Lung Epithelium.” Am J Respir Cell Mol Biol. 33:328-334. Oct 2005. Kotton DN, Fabian AJ, Mulligan RC. “A novel stem cell population in adult liver with potent hematopoietic reconstitution activity.” Blood. 106:1574-1580. Sept 2005.